The National Council of Municipal Health Secretaries and the National Front of Brazilian Mayors warned rightwing President-elect Jair Bolsonaro of the imminent, irreparable damage to the population’s health, as a consequence of Cuba leaving the More Doctors program. 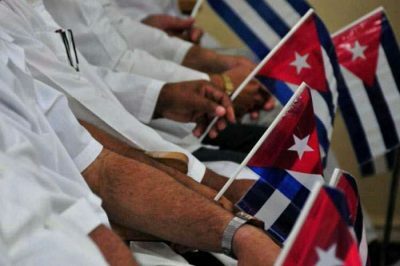 In a joint statement, the two organizations lamented the suspension of the agreement between the Pan American Health organization and the Cuban government which allowed for the work of some 8,500 doctors from the island in Brazil. Estimates indicate that 29 million Brazilians will be left without medical assistance after the partnership’s interruption. Thus, these bodies have requested a revision of the position taken by the new government, which has announced its intention to make drastic changes to the program’s regulations. The mayors and healthcare authorities called for maintaining current contract conditions, which were approved in 2016 by the Michel Temer administration and confirmed by the Supreme Federal Court in 2017. “The abrupt cancelation of the current contracts implies a cruel impact on the entire population, especially the poorest. We cannot renounce the constitutional principle of making the right to health universal, or agree with this setback,” the statement indicated. Cubans currently represent more than half of the doctors in the program, and the cancellation of their contracts would lead to a situation described by these organizations as disastrous, in at least 3,243 municipalities. Of the country’s 5,570 municipalities, 3,228 (79.5%) only have doctors provided by the program, and 90% of the services available to the indigenous population are provided by Cuban professionals. The program was won by Brazilian municipalities, developed in response to the “Where is the doctor?” campaign led by the Mayors Front in 2013. At that time, local officials made clear the difficulties they faced in contracting and placing professionals in the country’s interior, and in poor communities on the outskirts of large cities. The text notes that the abrupt interruption of cooperation with the Cuban government, focused on prevention at the primary level, will negatively impact the health system, increasing demands for doctors’ appointments at higher level institutions, and additionally aggravate regional inequalities. “For the poor, this will be an irreparable loss. “The end of the agreement was caused by the intemperate statements of President-elect Jair Bolsonaro, who ignores the diplomatic dimension that must prevail in relations between two countries,” continued the former President who launched the More Doctors program. For the poorest, the end of the program will be a great loss in the short and long run. Tens of millions of Brazilians across the entire country will be without primary care, Rousseff stated, describing Bolsonaro’s decision as unilateral and disrespectful, “criticizing on Twitter the terms of the agreement signed during my administration and renewed, without modifications, by the government of President Temer,” she noted. Rousseff recalled the President-elect’s statements that he would impose individual contracts on foreign participants in the program, require exams and the validation of credentials, and pay professionals directly, ignoring the Cuban government’s guarantee of a full salary for doctors. “The demand to subject foreign doctors to an exam in Brazil can only be seen as a gesture of disrespect, xenophobia, and arrogance, directed toward health professionals from other countries. Especially since the (Cuban) Ministries of Public Health and Education supervise the work of all doctors and evaluate their performance,” she continued. According to Rousseff, Bolsonaro’s affront to Cuban doctors, and those from other countries working in the program, is an attack on the Brazilian people, who will lose access to valuable, highly-skilled professionals providing primary care to the poorest sectors of the population. “Moreover, this is an authoritarian attitude. It reveals incompetence, unilaterally breaking an agreement signed by a respected, internationally recognized health organization. “The Brazilian population has benefited from the generous competence of Cuban doctors, who the Brazilian government should recognize for their fraternal solidarity. I convey a tribute to them, my gratitude. The work of these dedicated, generous professionals will be missed by Brazilians,” she concluded.